Lugana, a luminous white wine with a floral, citrus bouquet, may not be familiar to many wine lovers. Relatively unknown until recently, this gem from the southern shores of Lake Garda in Northern Italy is gaining in popularity, due to its versatility and food friendliness. Mineral, with vibrant acidity, it has an intense, complex bouquet and a fresh, pleasant palate of green apple, white peach, and citrus, perfect for seafood, or to enjoy by the glass. 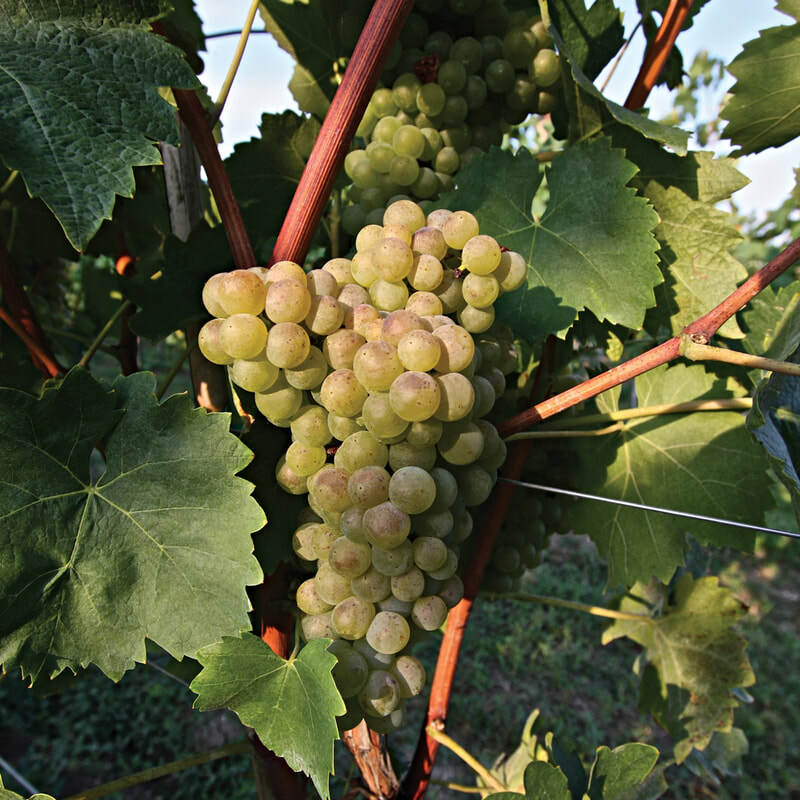 Lugana is made from Turbiana, the local name for a wine grape that is genetically identical to Trebbiano di Lugana and Verdicchio Bianco, which is only found in the Lugana region. 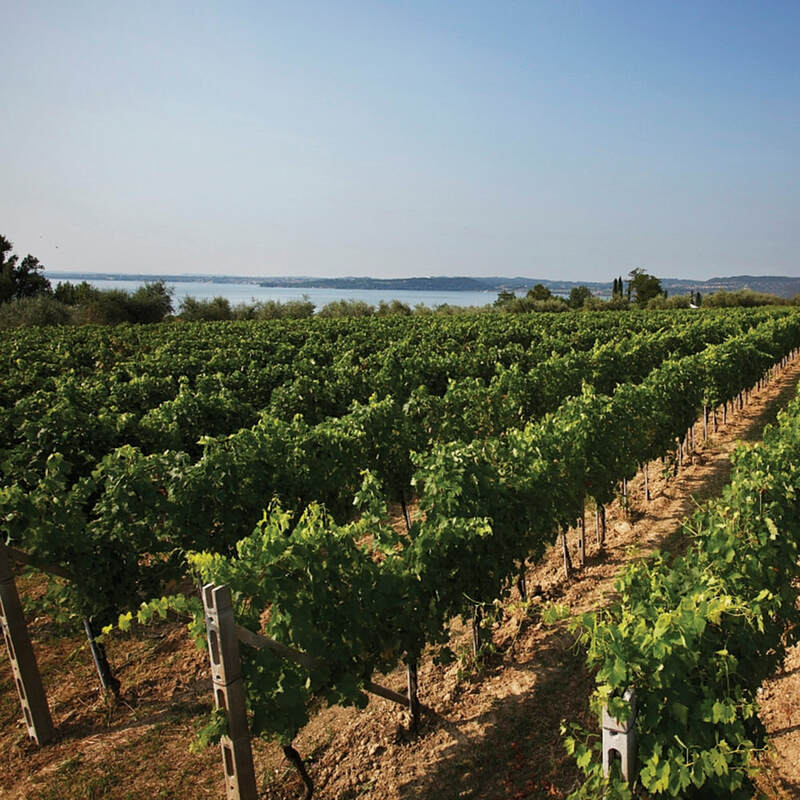 It’s thick-skinned and late ripening, luxuriating in the mild climate surrounding Lake Garda, where the vineyards lie at the division of the northern continental climate and the southern Mediterranean one, belonging to two wine regions, Lombardia and the Veneto. Lugana’s charms are reminiscent of Chenin Blanc, it can be vinified in many different incarnations, from sparkling to late harvest, and is capable of evolving and aging into a complex wine, assisted by a combination of sur lie and mixed vessel aging of steel and wood. Within the past 20 years, producers have discovered its aging potential, the Superiore, Riserva, and late harvest classifications have been introduced, increasing its charm and elegance. As Lugana ages and gains complexity, it develops an intense yellow color with gold highlights, and a stronger profile of yellow fruit, lemongrass, and an almond note. The higher quality wines are more lush, with notes of pineapple and mandarin orange, and a green almond note that becomes more hazelnut as the wine ages. For Italians, wine is considered part of the meal, the time-honored tradition of food and wine pairing. In this vein, Lugana channels Gruner Veltliner and Riesling, because of its acidity and versatility, it's a great food wine that can pair well with most cuisines. Lugana exports more than 70% of its production outside of Italy, with Germans claiming the lion’s share. Each vintage is sold out before the next harvest, between local Italian consumption and outside demand, the mineral Lugana enjoys a sweet spot, a small production from a tiny appellation that has enthusiastic wine drinkers clamoring for more. Now the US is getting a chance to claim some of this wine for consumers, as the Consorzio Tutela Lugana DOC is seeking new markets for their wines, to keep a steady demand even if wine trends change. Lugana in all its glory was explored over a LA Wine Writers lunch at Cafe del Rey with Brand Ambassador Laura Donadoni. Five wines were poured throughout a five course meal, expertly crafted by Chef David Vilchez, which demonstrated Lugana’s versatility center stage. Lugana’s character lends itself well to the Spumante process, a limited production of both Charmat and Classic Method techniques, which yield a fresh, fragrant, yet savory sparkler. The Cascina Maddalena “Leonardo” Lugana Brut Metodo Classico was elegant, silky yet mineral, with fine bubbles, Meyer Lemon and yeast notes, and a long finish, a good way to whet your appetite. The Montonale Montunal Lugana DOC 2015 embodied the full character of Lugana, floral, stonefruit, and citrus, mineral with a slightly almond finish, fresh and bright with layers of flavor and a creamy texture from time on the lees. It went very well with the Smoked Salmon Pita with Tzatziki, Mixed Greens, and Olive Vinaigrette. Lugana Superiore, fermented in oak and aged for at least one year in bottle, displays more complexity, with apple, citrus, white flowers, herbs, almond and spice, a mineral character, structure, and a touch of salinity, a beautiful and elegant wine. The Cá Lojera Lugana Superiore 2014 was an intense wine, with aromatic herbs on the nose, a hint of botrytis, and lots of structure, a Meyer Lemon, stonefruit, and almond flavor profile, with a persistent finish. This was a stellar pairing, Seared Scallop over Saffron Risotto, with Capers and drizzled with Olive Oil. The Lugana Riserva, aged for 24 months, was more evolved, with notes of flint and mineral. The Sergio Zenato Lugana Riserva 2014 was complex, channeling lemon custard, vanilla, and honey flavors, a perfumed wine, not as mineral as the others, yet with a long finish. Served alongside Swordfish and Squash Blossom, drizzled with a Passion Fruit Vinaigrette, this fuller-bodied wine was beautiful. Vendemmia Tardiva, a late harvest rendition, is a good balance of sweet and acid. 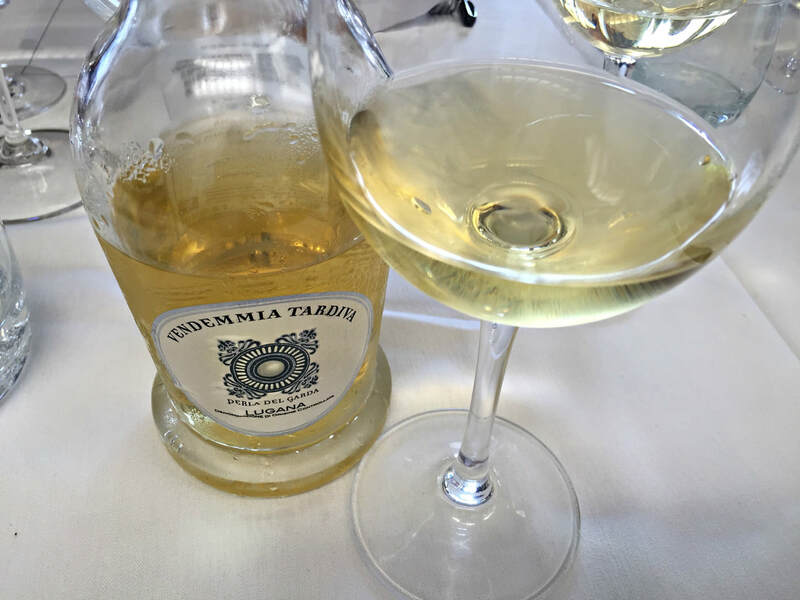 The Perla del Garda Lugana Vendemmia Tardiva 2013 was more semi-sweet, with intense flavors of pear, almond, ginger, candied fruit, and a hint of saffron, its fresh acidity giving balance to the wine. 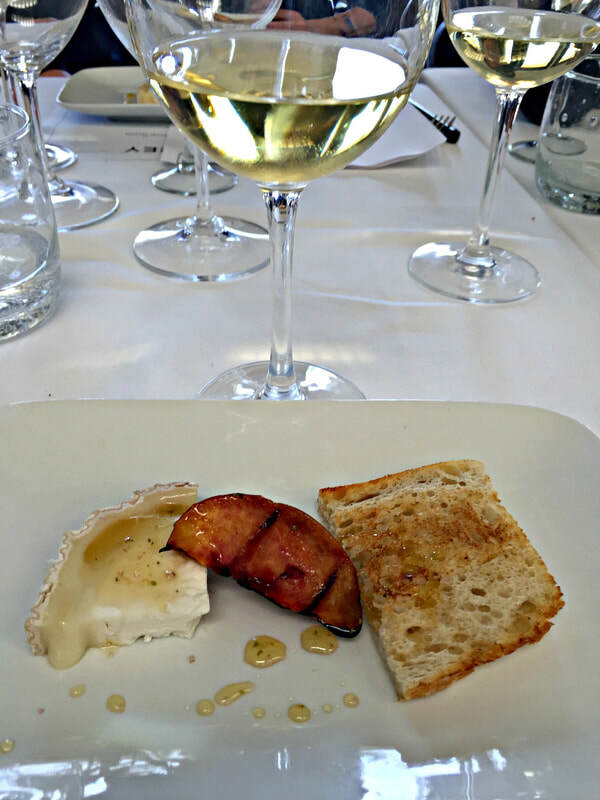 Served with Bucheron Cheese, Grilled Peach, Sourdough Bread and drizzled with Honey, the wine itself was a stunner, and almost didn't need anything to accompany it. These high quality wines are all DOC designated, so refreshing and crisp, fascinating with its honeyed notes while still remaing bone dry. Once the hidden gems of this region of Italy, the secret is out, Lugana is now seeking the spotlight on the world wine stage. The Turbiana grape, unique to Lugana, has proven itself worthy over its 50 years of DOC classification, a white wine that is a perfect companion, by the glass and with food. An additional perk, these wines are reasonably priced, with all versions, except for the late harvest, retailing at or under $20 a bottle. Mouthwateringly fresh, mineral but not too high acid, with some flavor intrigue from the different aging regimens, these wines are a crowd pleaser, great for holiday celebrations or lazy summer days.